Seat-in-Coach experience with some of the most spectacular game viewing in 4×4 open safari vehicles exploring the diverse range of habitats. The thrill to see herds of elephants, a leopard or lioness never lessens. Daytime and sunset cruises, fishing, island picnics, walks and guided tours. 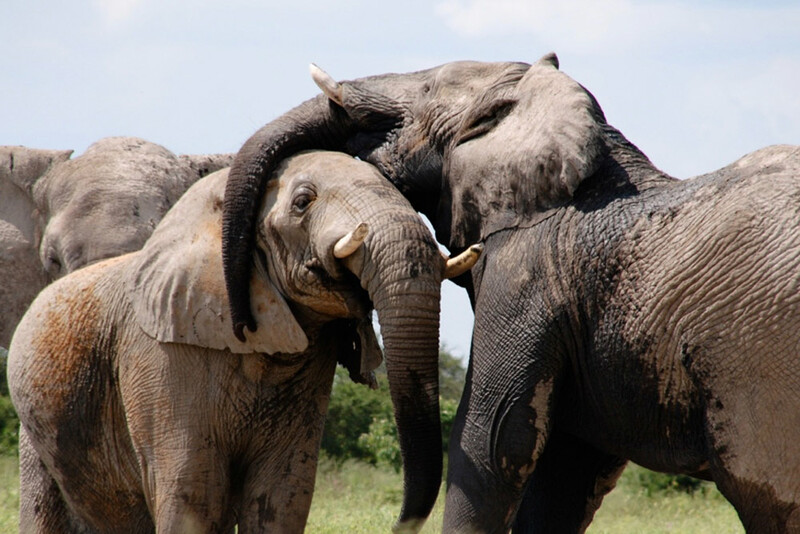 Game drives into the Chobe National Park and night drives in the Chobe Forest Reserve. 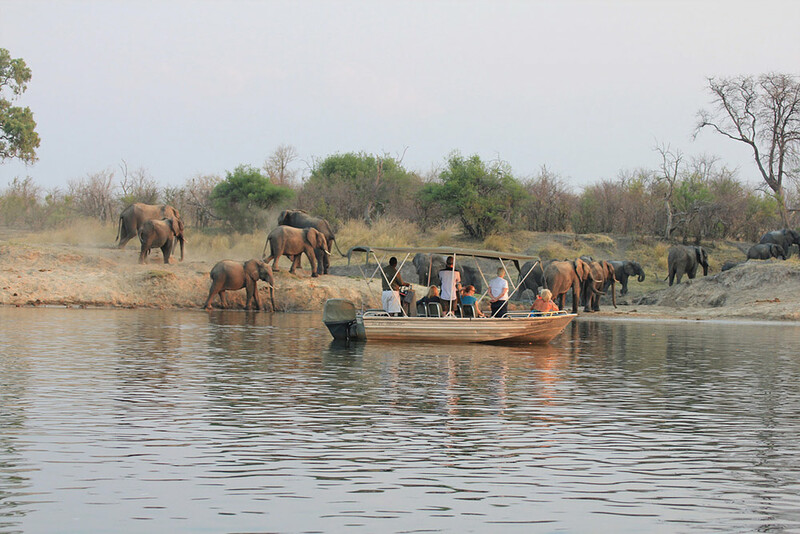 Boat cruises on the Chobe River. On arrival at Livingstone Airport, you will be met by our representative and transferred to Waterberry Lodge by road where you will spend the next two nights. In-house activities include a tour of the Falls, sunset cruise, daytime cruise, fishing, island picnics, guided birding, guided village walk and guided tour of the town and local markets – depending on the rate basis these are included or excluded. 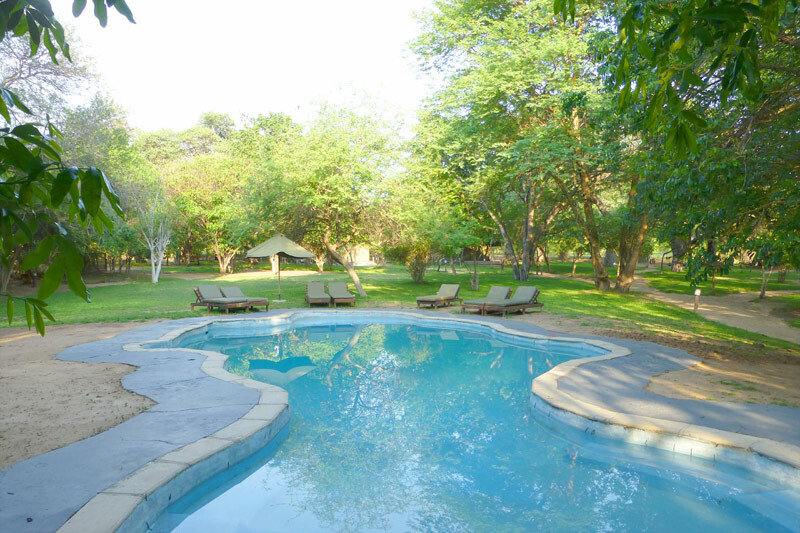 All other activities offered in Livingstone can be pre-booked or booked at the lodge on arrival. Fee to enjoy the activites at the Lodge. Following breakfast, you will be transferred by road and boat to Elephant Valley Lodge in Chobe (approximately 2 hours), where you will spend the next two nights. 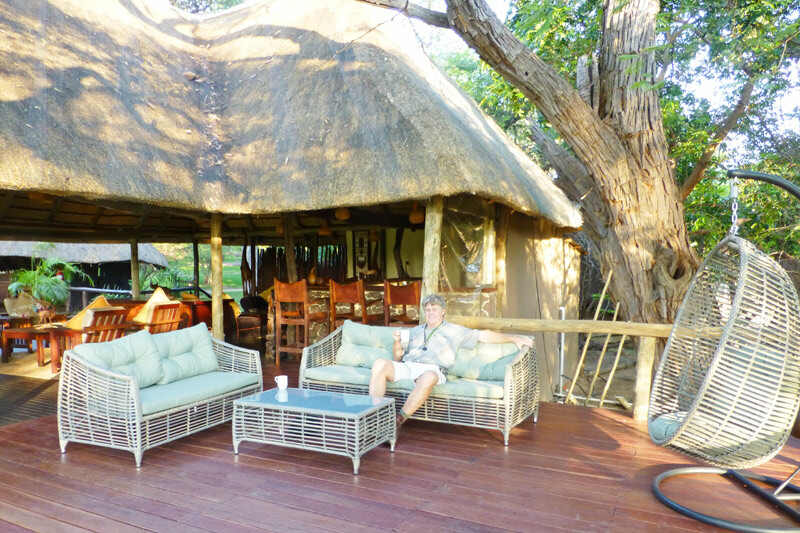 The lodge offers two activities per day from the following options: game drives into the adjacent Chobe National Park, night drives in the Chobe Forest Reserve as well as boat cruises on the Chobe River. 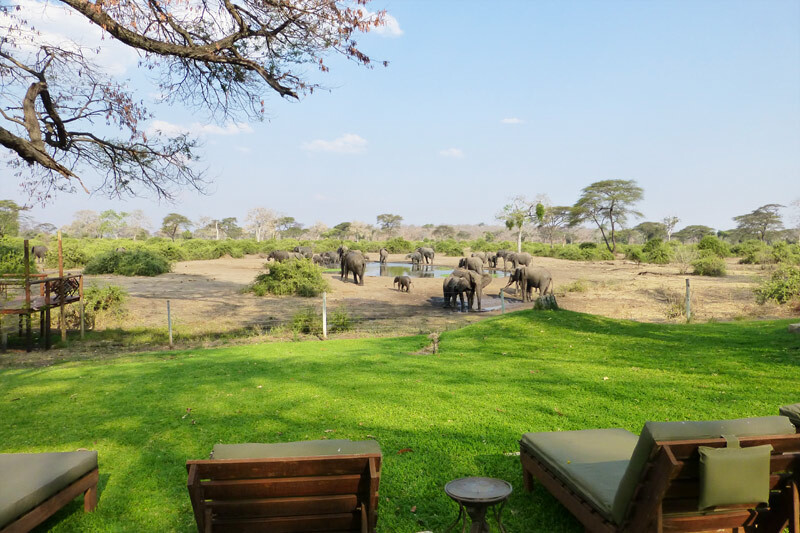 The large elephant population is staggering in the Chobe region and their regular visits to the waterhole offer an incredible sight – you barely need to leave the lodge to have a real Chobe elephant experience! Free to choose and enjoy the options offered by the lodge. Overnight at Elephant Valley Lodge. Following the morning activity (time permitting), you will be transferred to Kasane airport for onward air transfer to Kwara, followed by a road transfer/game drive en route to Kwara Camp. Kwara is renowned for being a camp that offers an all year round delta experience and a diverse range of activities including mokoro trips, guided walks with armed guides and motor boating trips through the waterways. In addition, day and night game drives are taken to explore the area which offers spectacular scenery with scattered herds of plains game and ever-attendant predators. Free to choose optios offered by the lodge. After an early morning activity and breakfast, you will be transferred to Pom Pom Camp by light aircraft, where you will spend the next two nights. 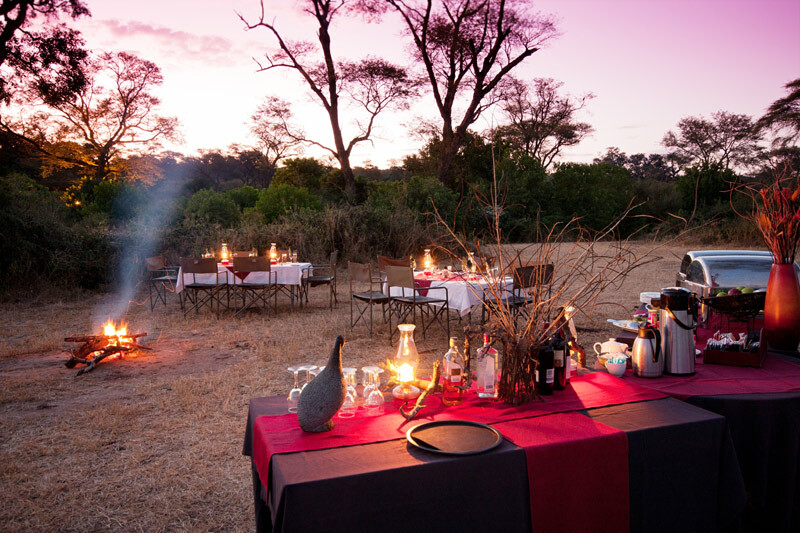 The Camp offers game drives, night drives, walking safaris and mokoro excursions. Overnight at Pom Pom Camp. Free to enjoy activities offered by the Camp. Following the morning activity, you will be transferred to Maun by air and onward to Meno-A-Kwena by road (approximately 1.5 hours drive from Maun). Activities at Meno A Kwena include walking trips and cultural activities with a local community guide. 4WD safaris are also available, varying from short trips to the nearby Ngandi Community Trust Area to full-day safaris with a picnic into Makgadikgadi National Park or Nxai Pan National Park. 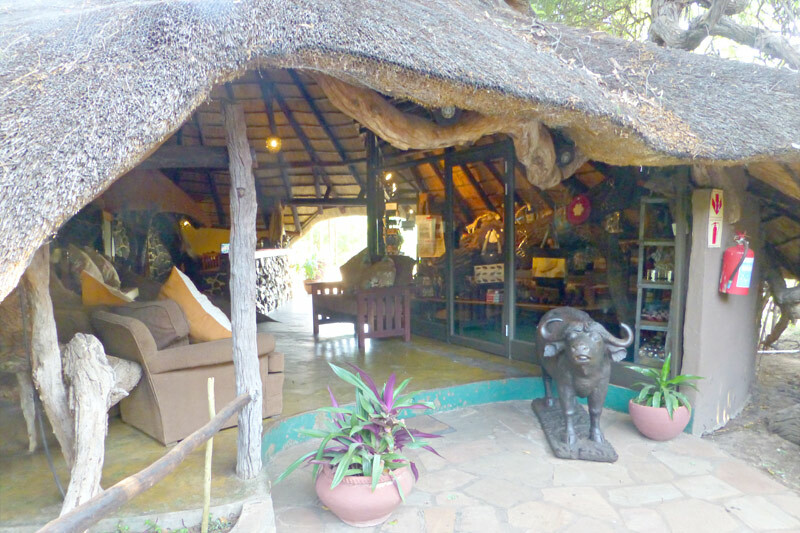 Meno A Kwena’s informal atmosphere makes a very relaxing stay after the hectic round of activities at many camps. Overnight at Meno A Kwena Tented Camp. After breakfast, you will be transferred to Maun by road for your onward travel arrangements or you have the option of extending your stay for a further two nights. Road transfer from Livingstone Airport to Waterberry Lodge. 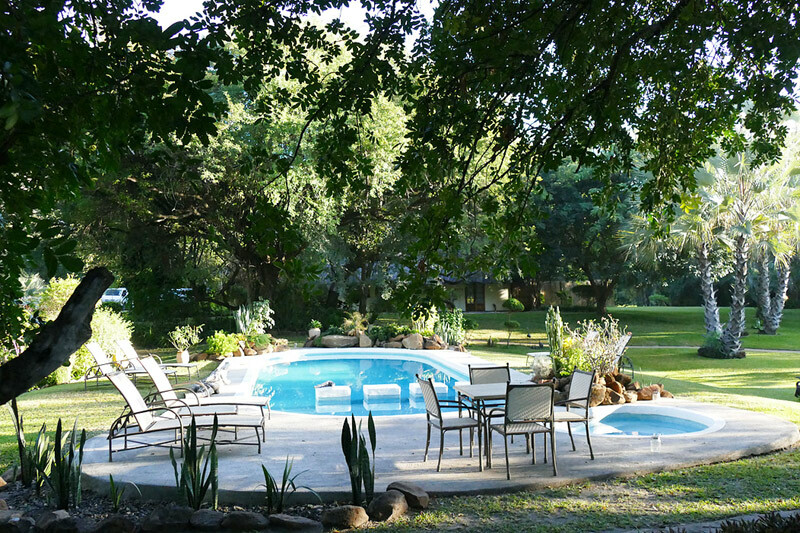 2 Nights Waterberry Lodge, Livingstone (including meals, local beverages, 2 in house activities per day, Victoria Falls entry fee and Laundry). Road and boat transfer from Waterberry Lodge to Elephant Valley Lodge. 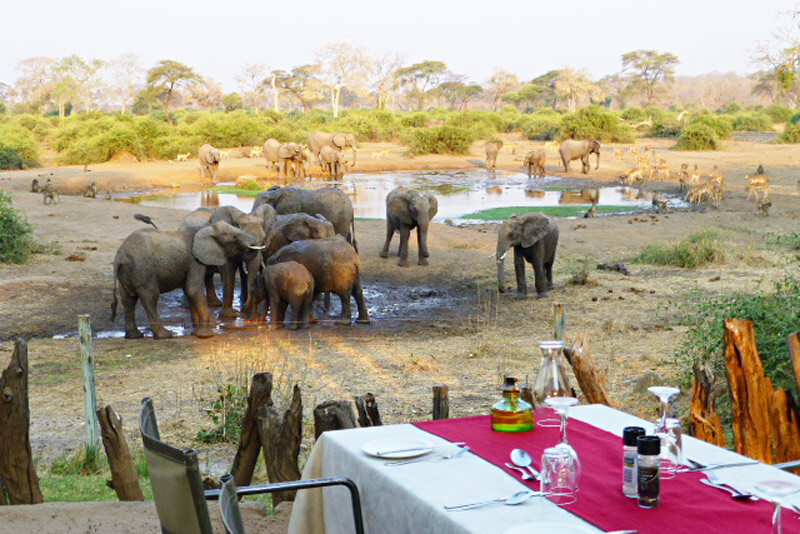 2 Nights Elephant Valley Lodge, Chobe Forest Reserve (including meals, activities and 2 days Park Fees, excluding Beverages and laundry). Seat in charter from Kasane to Kwara Camp. 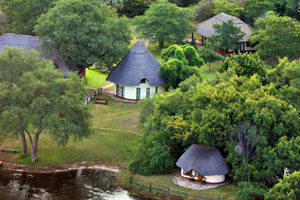 2 Nights Kwara Camp, private Okavango concession bordering Moremi Game Reserve (fully inclusive). Seat in charter from Kwara Camp to Pom Pom Camp. 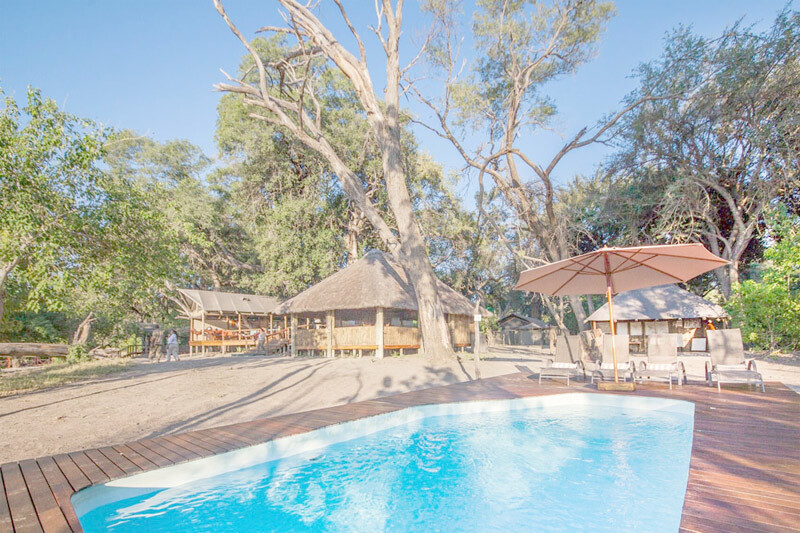 2 Nights Pom Pom Camp, private concession in the Okavango Delta (fully inclusive). Seat in charter from Pom Pom to Maun, onward road transfer from Maun to Meno A Kwena. 2 Nights Meno-A-Kwena, Makgadikgadi/Boteti (fully inclusive). Road transfer from Meno A Kwena to Maun. International flights unless otherwise specified. Beverages and laundry whilst at Elephant Valley Lodge. Premium imported wines, champagnes, spirits & liqueurs where drinks are included. 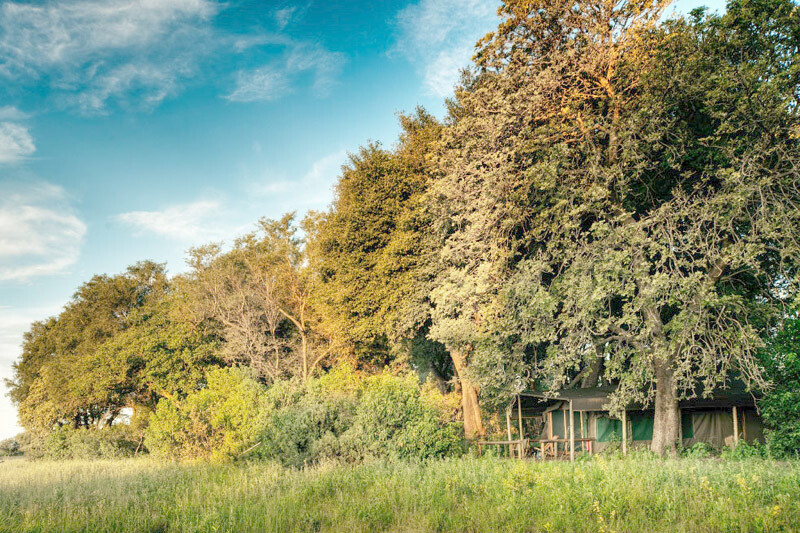 Nestled between Botswana and Zimbabwe, Elephant Valley Lodge lies hidden in the Lesoma Valley in the Chobe Forest Reserve, only a few miles outside Kasane. 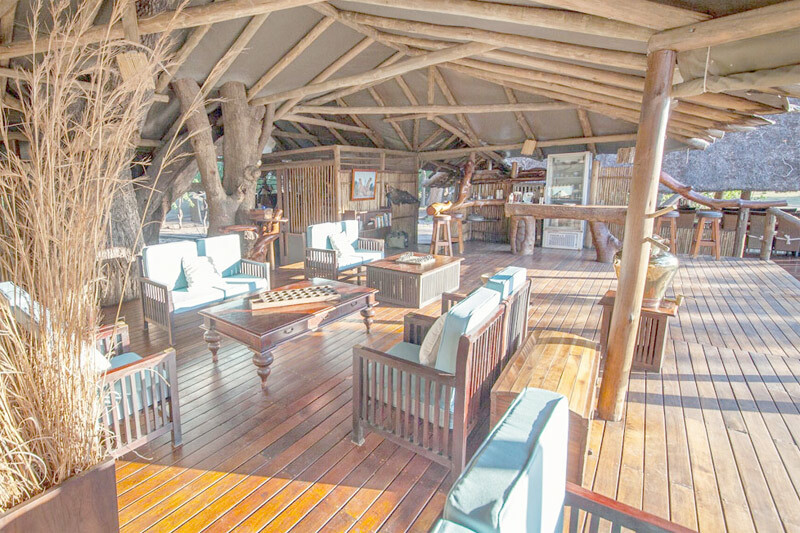 The Lodge is set amongst massive camel thorn trees and overlooks a large waterhole which attracts regular herds of elephants, thus offering round-the-clock game viewing. Elephant Valley Lodge offers twenty traditional meru-style safari tents with comfortable furnishings, each with private en-suite bathrooms. 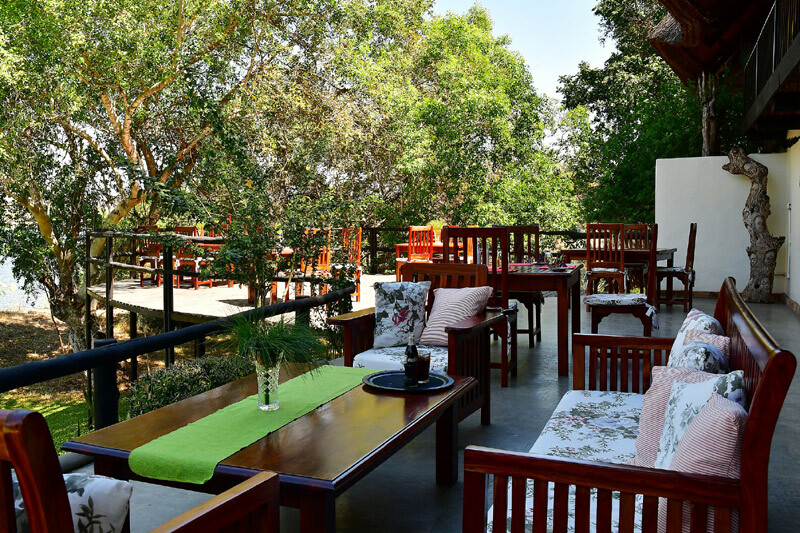 The public areas consist of a dining room and bar as well as a beautiful terrace with magnificent views overlooking the waterhole. There is a swimming pool for your enjoyment in the hotter months and spacious grassy grounds in which to relax. 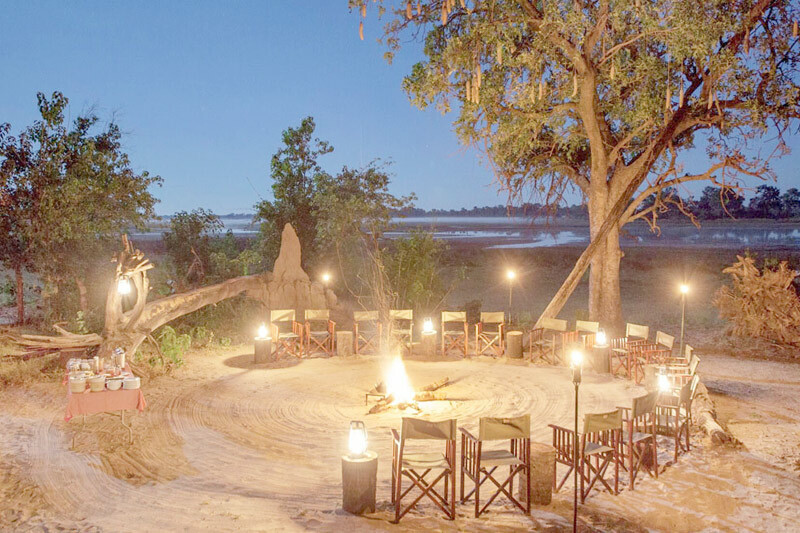 Kwara Camp is situated on a private concession on the edge of the permanent waters of the world renowned Okavango Delta in Botswana, which shares a common boundary with Moremi Game Reserve. The area offers a combination of permanent water, seasonal floodplains and pans, open grasslands as well as extensive dry bush and scrub which creates a great game viewing destination throughout the year. 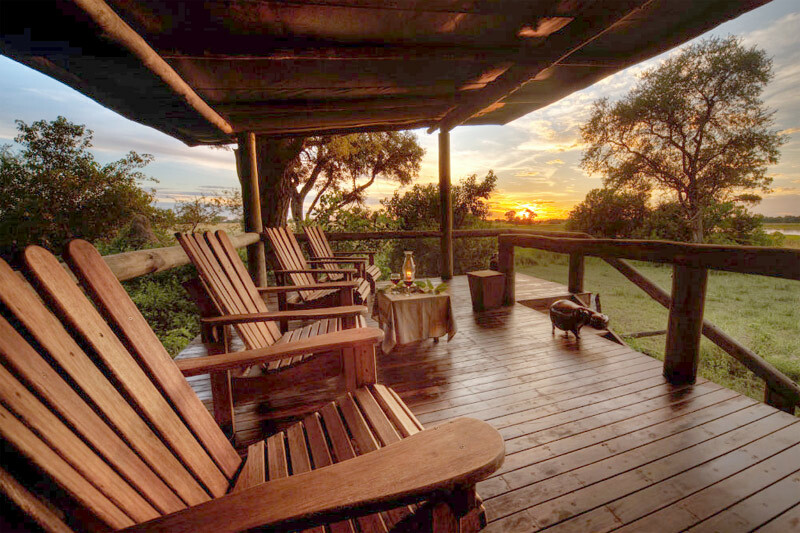 The eight luxury safari-style tents are built on raised decks within a grove of huge and ancient African Ebony trees. Each tent has an en-suite bathroom with the luxury of a bath and indoor/outdoor shower and a private deck with views across the floodplain. 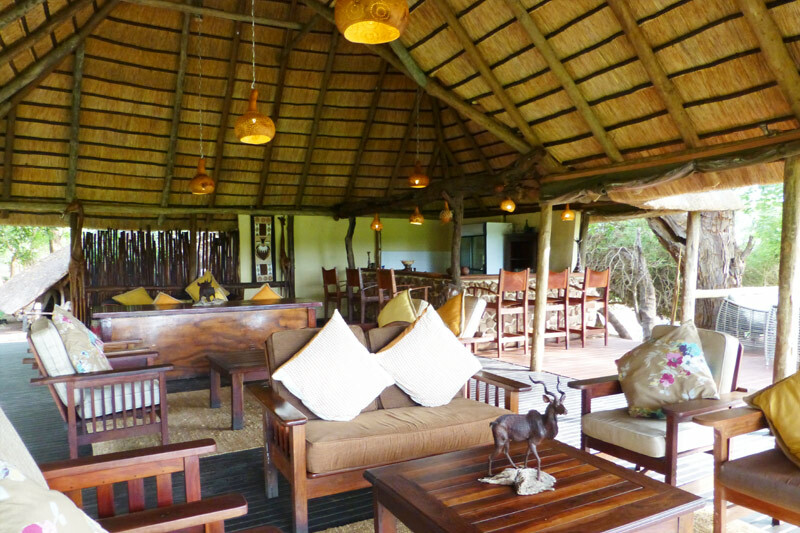 There is a lounge, bar and dining area in the central lodge as well as a plunge pool and gift shop. Evenings can be enjoyed around the outside fire area. Kwara is renowned for being a camp that offers an all year round delta experience and a diverse range of activities including mokoro trips, guided walks with armed guides and motor boating trips through the waterways. In addition, day and night game drives are taken to explore the area which offers spectacular scenery with scattered herds of plains game and ever-attendant predators. Meno A Kwena, meaning “tooth of the crocodile”, borders Makgadikgadi National Park in close proximity to Nxai Pan National Park. 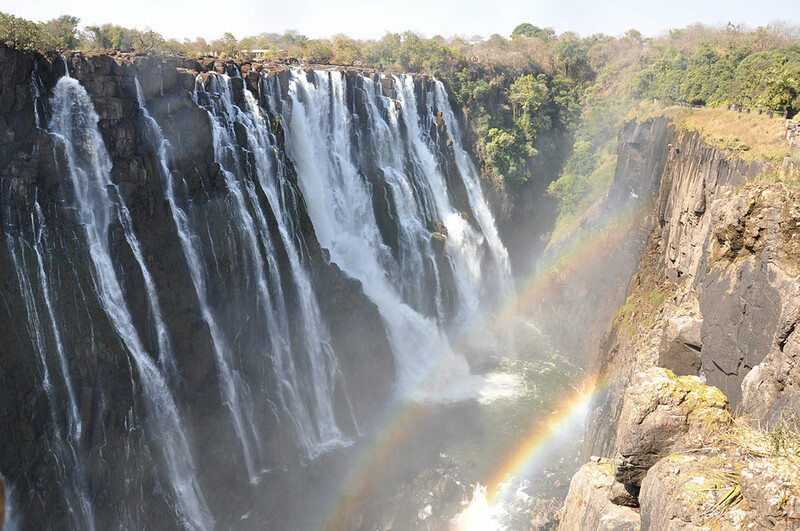 The camp is situated on tribal land and has been built on a cliff edge overlooking the Boteti River, which is now flowing again for the first time in almost 15 years. This rustic camp is built in the tradition of eastern African tented camps, simple yet personal with attention to rich detail featuring many interesting artifacts and photographs on display in the main lodge. 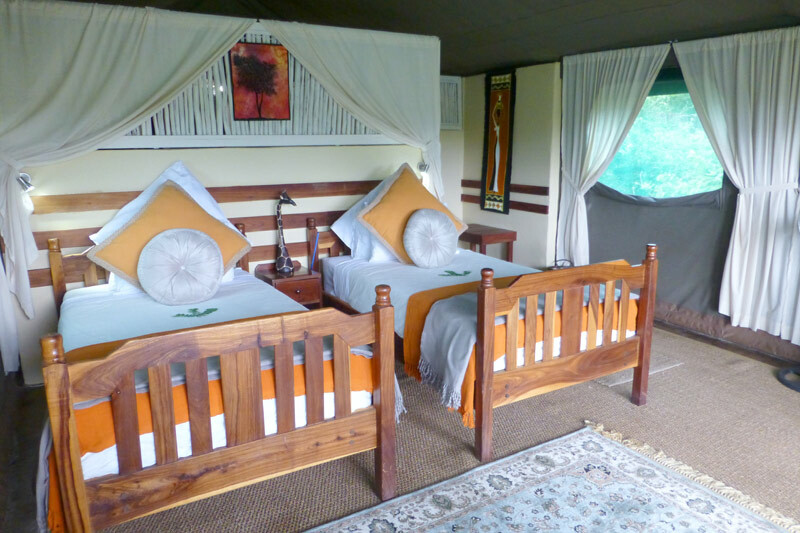 Meno A Kwena offers seven meru-style safari tents, simply furnished with comfortable bedding and hanging space. Separate to each tent are private open air bathrooms with a traditional bucket shower (filled with piping hot water for daily showers) and a flush toilet. Each tent features a private sitting area, which offers a beautiful view over the river. The main lodge has a dining area, bar and lounge with small library. A covered seating area at the edge of the escarpment is popular, providing guests with a breathtaking view over a waterhole that attracts many zebra and wildebeest herds during the migration months (June to November). 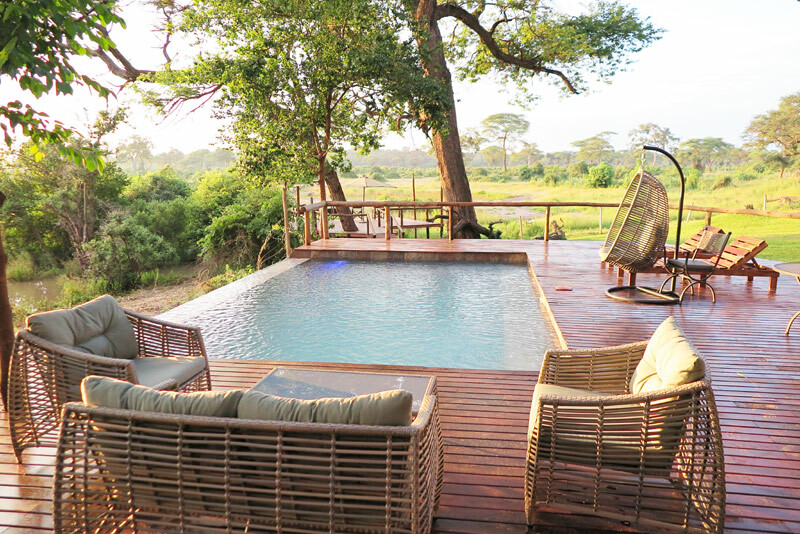 There is a small plunge pool built with natural rocks and a game viewing hide which offers a close yet safe view across the waterhole. Activities at Meno A Kwena include walking trips and cultural activities with a local community guide. 4WD safaris are also available, varying from short trips to the nearby Ngandi Community Trust Area to full-day safaris with a picnic into Makgadikgadi National Park or Nxai Pan National Park. 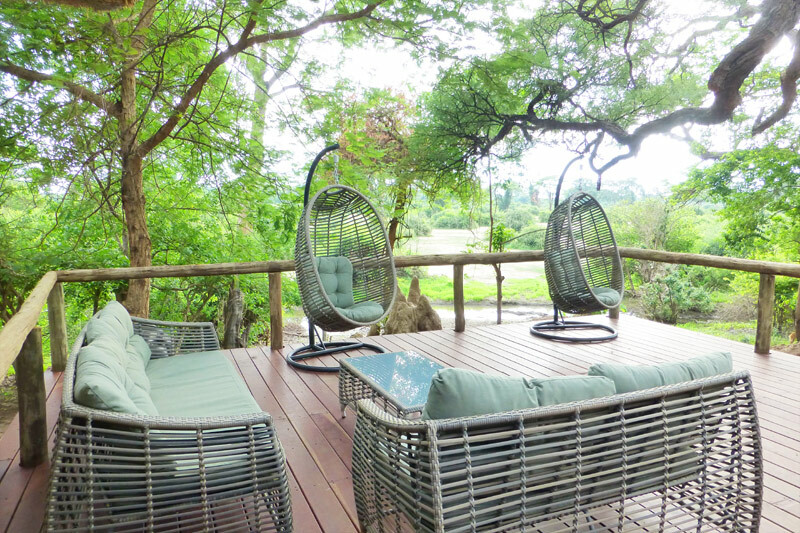 Meno A Kwena’s informal atmosphere makes for a very relaxing stay after the hectic round of activities at many camps. 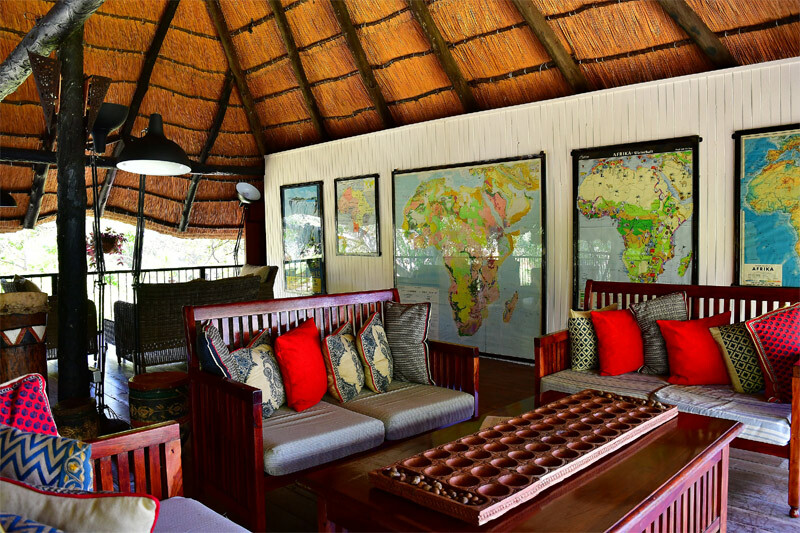 Pom Pom is located in the heart of the Okavango Delta in a private concession to the west of the Moremi Game Reserve. 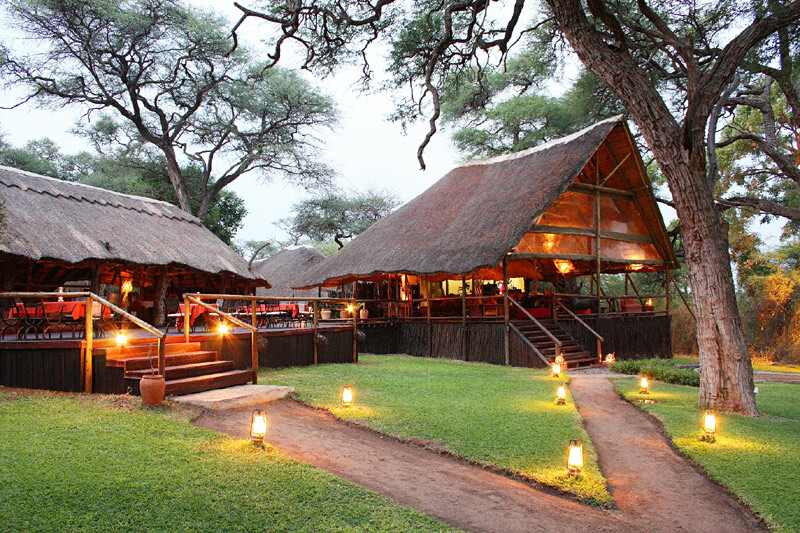 The camp offers 9 traditional Meru safari tents, built and designed in the style of safari camps of old. The large walk-in tents have en suite showers and flush toilets. 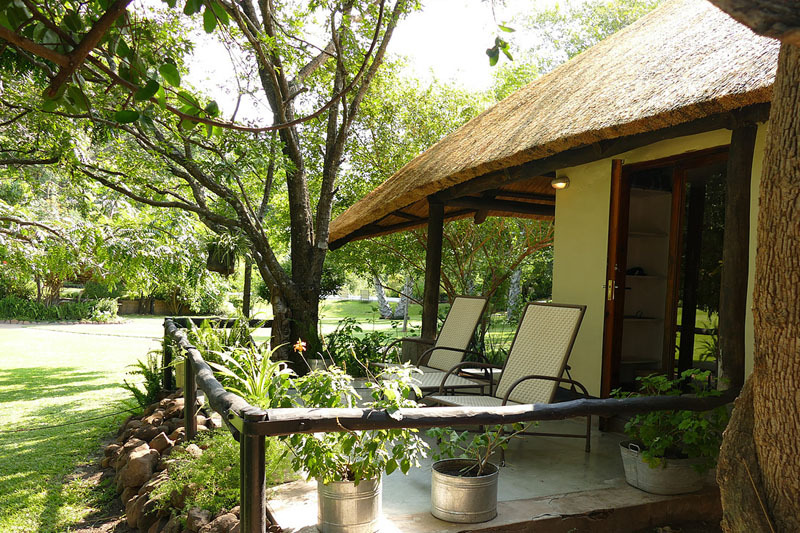 The bathrooms are enclosed, but roofless – for a true bush experience. 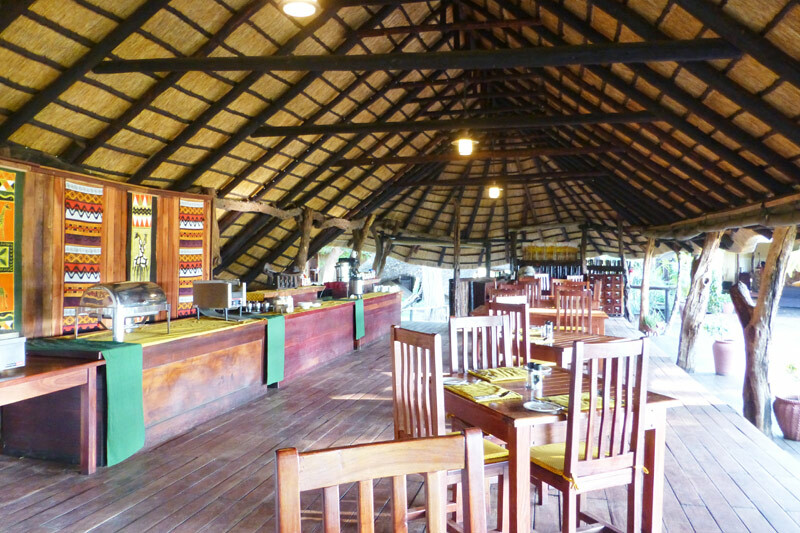 The camp has been recently renovated and offers a beautiful dining room and bar around the picturesque lagoon. Pom Pom Camp also has a nicely sized plunge pool to help guests escape the midday heat. 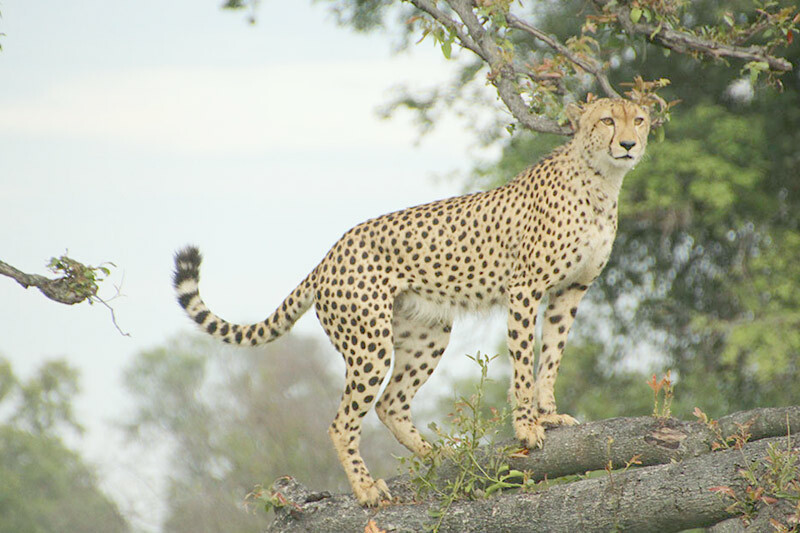 Pom Pom offers game drives, night drives, walking safaris and mokoro excursions. All the big predators, and Buffalo, Giraffe, Zebra, Wildebeest can be seen. If you are lucky, some of the nocturnal animals such as Serval, Civet and Genet may be seen on night drives. Hippo and Crocodile are found in the deeper lagoons in the area. Birding enthusiasts will enjoy sighting Pells Fishing Owl, African Fish Eagle, Giant Eagle Owl and White Backed Vultures. 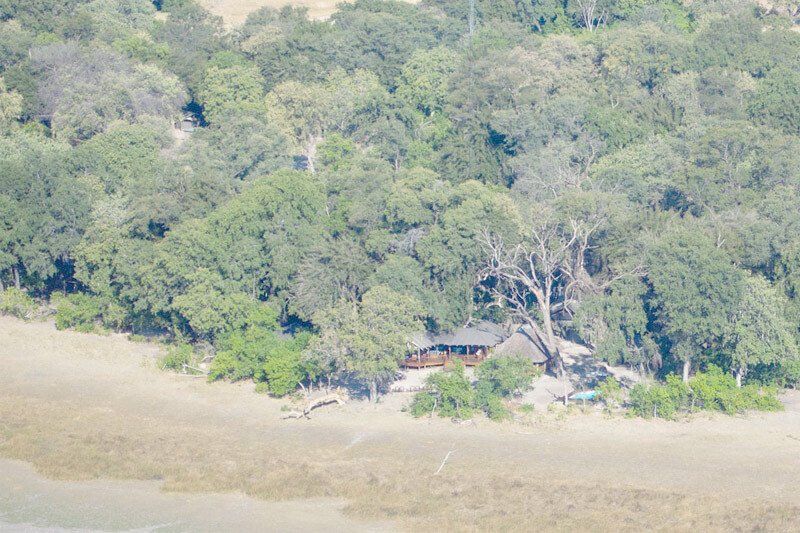 Waterberry Lodge is situated on the banks of the Zambezi River about 13 miles from Livingstone, towards Kazungula. 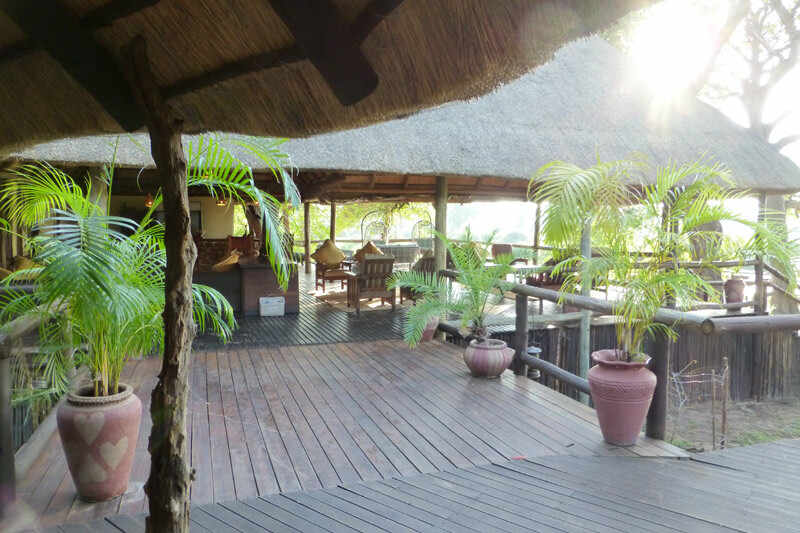 The main double-story Lodge area overlooks the Zambezi River and the game park beyond. Upstairs the main lounge is open to the high thatch with plenty of seating and boasts a well-stocked bar and magnificent views. 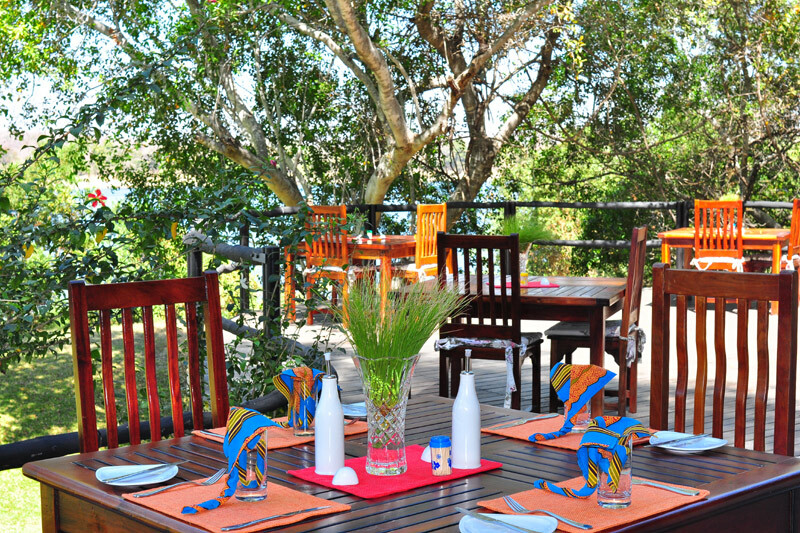 Meals are served in the dining area or alfresco on the sun terrace that overlooks the river. A floating pontoon gently sways on the Zambezi River, making it the perfect location for sun downers, fishing or just relaxing and enjoying the view. A large and welcoming swimming pool is set in the center of the landscaped gardens and has a small plunge pool with a shallow end, making it safe for children. The comfortable chalets are set in sweeping lawns – some on the river bank and some overlooking a private dam. 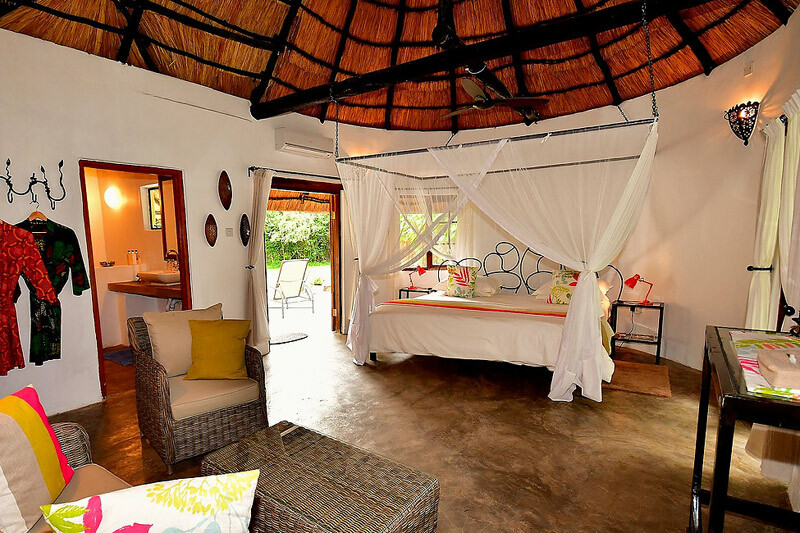 Several of the rooms have their own private decks for sunbathing, bird watching, private dinners or just relaxing. In-house activities include a tour of falls, sunset cruise, daytime cruise, fishing, island picnics, guided birding, guided village walk and guided tour of the town and local markets – depending on the rate basis these are included or excluded. All other activities offered in Livingstone can be pre-booked or booked at the Lodge on arrival.